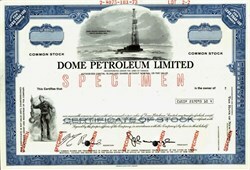 Beautifully engraved specimen stock certificate from Dome Petroleum Limited printed in 1973. This historic document was printed by the American Banknote Company and has a vignette of the Dome Winter Harbour Well, Artic Islands 1962. This item has the printed signatures of the Company’s Chairman, Jack Gallager and Secretary, and is over 42 years old.